The cockpit is the home page of the application. Structured as a dashboard it provides a number of widgets that a planner uses in his daily planning activities. It is an efficient starting point for the common activities. The cockpit is configurable to meet the requirements and taste of your implementation. Customized widgets are also easy develop. In the Community Edition all users will see the same dashboard. In the Enterprise Edition every user gets his own dashboard, which he can customize interactively. Provides a high level overview of the open purchase orders, and new orders that will need to be created soon. Displays a list of new purchase orders that should be placed on your suppliers. Provides a high level overview of the open distribution orders, and new orders that will need to be created soon. Displays a list of new distribution orders that should be placed. Provides a high level overview of the open manufacturing orders, and new orders that will need to be created soon. This is the list of operations that are about to be started on each resource. Displays a list of customer orders that are about to be shipped. A welcome text to give first-time users some guidance to get started with the application. This widget picks up the latest news topics from frepple.com. Shows your most recent editing actions. Shows a summary of the exceptions and problem areas. Shows the most urgent orders that are planned late. Shows the most urgent orders that are unplanned or incompletely planned. Shows the urgency of the existing (locked) purchase orders. Displays the resources with the highest utilization. This widget shows the percentage of order lines that are planned to be shipped on time. This widget shows the locations carrying the most inventory. This widget shows the items which take up the most inventory value. Display an analysis of which item-locations have stockout risks. Depending on the stockout risk, a red/yellow/green color code is assigned. The widget shows the number of item-locations in each color code by location. Display the Symmetric Mean Percentage Error (aka SMAPE). The result is aggregated across all forecast per bucket, weighted by the forecast quantity. The widget is only available in the Enterprise Edition and when the forecasting module is enabled. The configuration is different in the Community Edition and the Enterprise Edition. 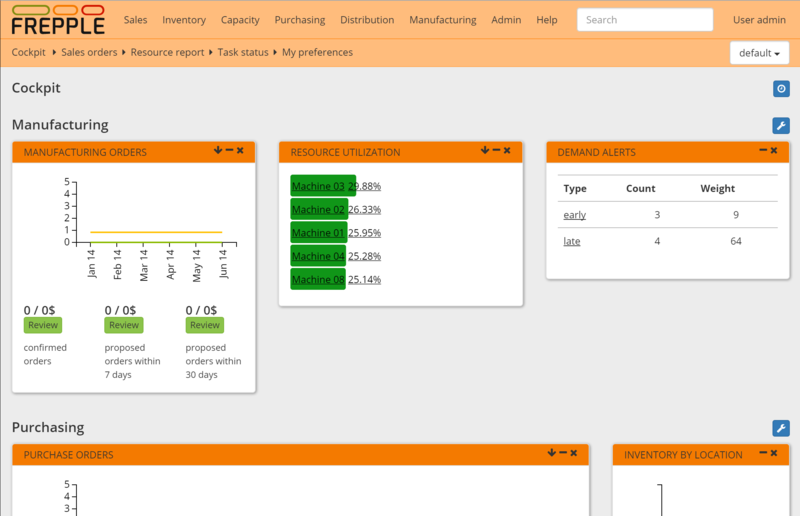 In the Community Edition the same dashboard is configured for all users. Administrators can configure it in the file djangosettings.py. In the Enterprise Edition every user can easily customize the dashboard with the widgets that are most relevant for his/her daily work.